The most expensive African player ever and Manchester City's record signing. In the City starting line-up to play Liverpool in New Jersey, Riyad Mahrez was something of a novelty. From a squad without 15 of its 16 World Cup players, the £60m signing from Leicester City was alone in having a realistic shot at starting the champions' Premier League opener at Arsenal on 12 August. The big question since Mahrez was signed by manager Pep Guardiola after a pursuit of the Algerian that goes back to last January, is whose place is under threat most. 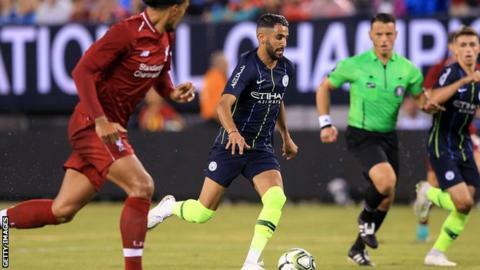 How many clues were there at the Giants Stadium in New Jersey on Wednesday, when City lost 2-1 to Liverpool in the International Champions Cup? Mahrez started on the right of a three-man attacking line, behind central forward Lukas Nmecha but slightly tucked in. Guardiola chose three in defence, with 18-year-old Luke Bolton the right-sided wing-back behind Mahrez. Bolton was one of six teenagers in a City team whose oldest outfield player apart from Mahrez, 27, was 23-year-old defender Jason Denayer. On a difficult pitch, Mahrez's close control was excellent. In the opening stages, he was able to gather the ball with his left foot before crossing into an area of danger with his right. Interestingly, Mahrez kept to the inside, more in the role of David Silva or Kevin de Bruyne rather than Leroy Sane or Raheem Sterling, the men deemed most at risk from the arrival of City's only summer signing so far. A through ball he played to Lukas Nmecha after drifting across to the left could easily have led to Guardiola's youthful outfit going ahead. The former Leicester man also curled a free-kick straight at Liverpool keeper Loris Karius late in the opening period. Mahrez was replaced by Tomiwa Dele-Bashiru after 74 minutes. In his four seasons at Leicester, Mahrez scored 48 goals - 39 of them in the Premier League. He also created 27 goals. Only Tottenham's Christian Eriksen (214) and Crystal Palace's Wilfried Zaha (234) attempted more dribbles than his 176 last season. Since Mahrez made his Premier League debut in 2014, only eight players - Eden Hazard, Diego Costa, Eriksen, Jamie Vardy, Alexis Sanchez, Romelu Lukaku, Sergio Aguero and Harry Kane - have been involved in more goals. Riyad Mahrez: "I'm confident I can help the team to win games and trophies. I showed in the last three years in the Premier League that I deserve to play at the highest level." Stuart Brennan, Manchester City correspondent for the Manchester Evening News: "Mahrez's signing looks a little strange at first, as he made his name at Leicester on the right, a position in which City already have Raheem Sterling and Bernardo Silva. But Pep Guardiola sees him as a player who can function across the front three. "City expect opponents to sit even deeper and present them with an even more compact defence next season, and Mahrez has the close control, turn of pace and tricks to find a way through those brick walls. He won't play in every game as he did at Leicester, but from what we have seen of him in training and the Dortmund game, he has slotted straight in to Guardiola's system - and has the right amount of confidence to fit into a team that was magnificent last season."